Human SCARB2, Fc Tag (SC2-H5250) is expressed from human 293 cells (HEK293). It contains AA Arg 27 - Thr 432 (Accession # AAH21892). The protein has a calculated MW of 72.5 kDa. The protein migrates as 90-115 kDa under reducing (R) condition (SDS-PAGE) due to glycosylation. Human SCARB2, Fc Tag on SDS-PAGE under reducing (R) condition. The gel was stained overnight with Coomassie Blue. The purity of the protein is greater than 95%. 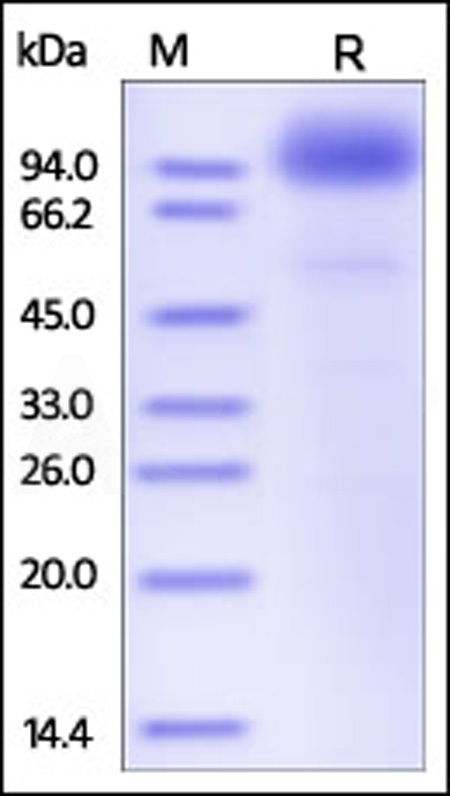 Scavenger receptor class B member 2 (SCARB2) is also known as Lysosome membrane protein 2 (LIMP2), 85 kDa lysosomal membrane sialoglycoprotein (LGP85), CD36 antigen-like 2 (CD36L2, LIMP2), which belongs to the CD36 family. SCARB2 acts as a lysosomal receptor for glucosylceramidase (GBA) targeting. (1) Reczek D., et al., 2007, Cell 131:770-783. (2) Schroeder B., et al., 2007, Traffic 8:1676-1686.